For a sport that is legendarily popular among writers, why there are so few good books among the dross? One of the few good ones is Moneyball, which has aged gracefully and added a few unintentional laughs along the way. 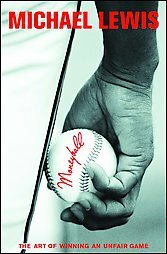 Michael Lewis provides actual insight to the workings of the game (the conclusion of the chapter on Scott Hatteberg, for instance, with the set-piece at-bat between the unfoolable Hatteberg and Jamie Moyer, the consumate junkballer, is worth the read in itself. Oakland GM Billy Beane looks less omniscient in 20-20 hindsight (in the draft chapter, Beane is overjoyed that Prince Fielder goes early so that he can draft Nick Swisher; the book mocks Texas for paying a big premium to sign their first-rounder, some no-name third baseman who turns out to be … oops … Mark Teixera); and Beane is pumped about picking up Jeremy Brown, John McCurdy, Benjamin Fritz, Mark Teahen and Brant Colamarino. Still, it provides a look into the world of drafting overlaid with the financial realities (Oakland can’t afford anyone represented by Scott Boras, for instance) that really is inside baseball. 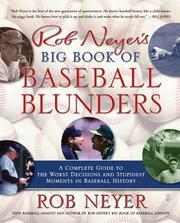 Another loser is Rob Neyer’s Big Book of Baseball Blunders. Among Neyer’s gems: Frank Robinson for Milt Pappas was a lopsided trade (see Ryan for Fregosi); so was Jay Buhner for Ken Phelps (ditto); Babe Ruth made a mistake when he got caught stealing to end Game 7 of a World Series (shock!) and that Pedro was left in one batter too long in the 2007 ALCS. The problem is that a) Neyer is a crappy, repetitive storyteller and … OK, the two problems are that Neyer is a crappy, repetitive storyteller and b) his “analysis” is shallow, offering little new to a retelling of general manager ghost stories (“and then the Red Sox traded Jeff Bagwell for Larry Andersen”) … ooh, scary! Neyer started out as a researcher for Bill James, and he tries to copy the swami, but Confucius says … err, James says, that anyone who tries to ape him fails because what’s best about James is his originality.